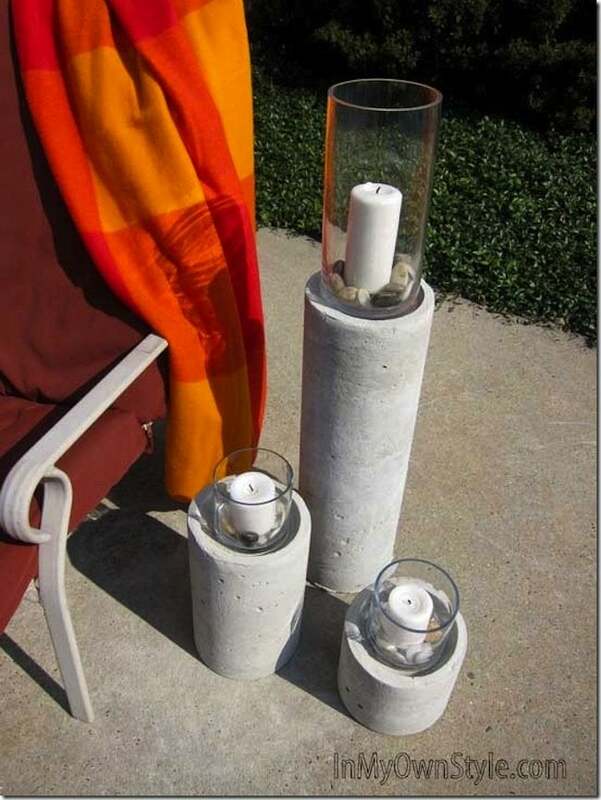 Give your home a catalog look with your own DIY concrete hack. 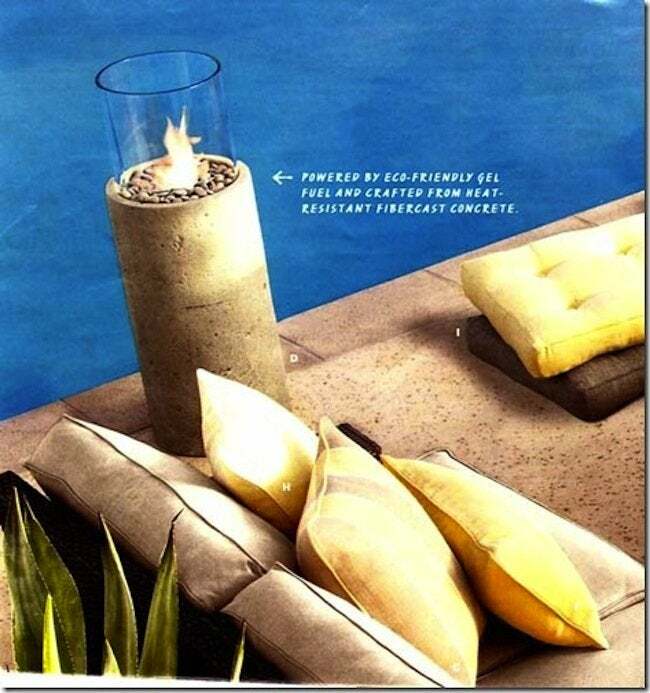 Inspiration comes in many forms—sometimes even in a store catalog. 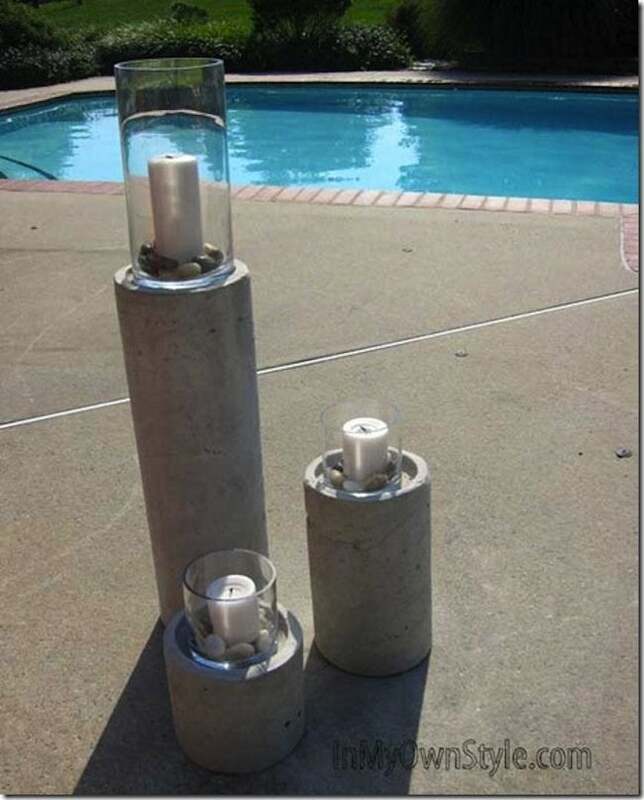 When Diane of In My Own Style saw these Concrete Fire Columns from Restoration Hardware, she realized she could make her own inexpensive version using building tubes as molds. That’s ingenuity! We loved her inventive and affordable hack so much, we had to share it. Read on for her tutorial. 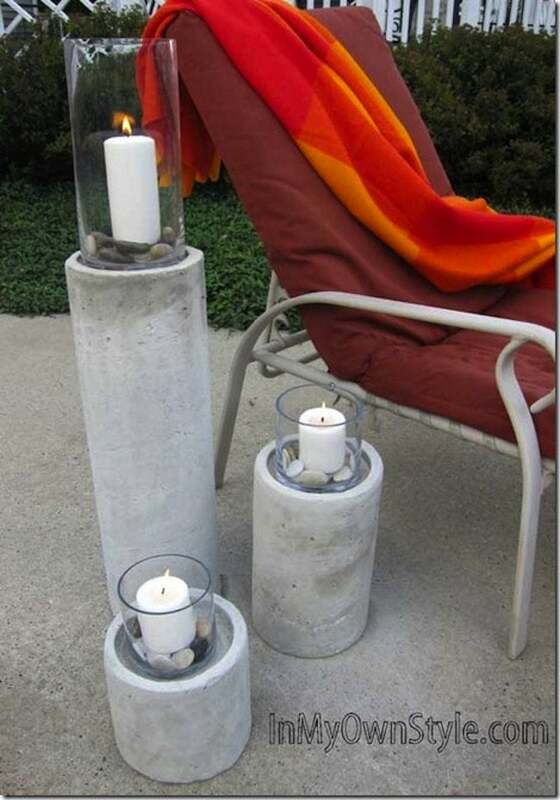 Here are the three concrete fire columns I made – they are not eco-friendly gel fueled, just plain old candlelight fueled. I sit out on my patio in the autumn a lot as it is my FAVORITE time of year. I wanted to get it all ready for the season by adding some ambiance for nights I like to go outside, relax on the chaise, and stargaze into the autumn sky. – (2) 80 pound bags of commercial grade Quikrete – this was enough to make all three. This mix has fewer stones in it and will produce a much smoother surface then the other mixes. The cardboard building forms look like this. They come in many different diameters. I used an 8” one. 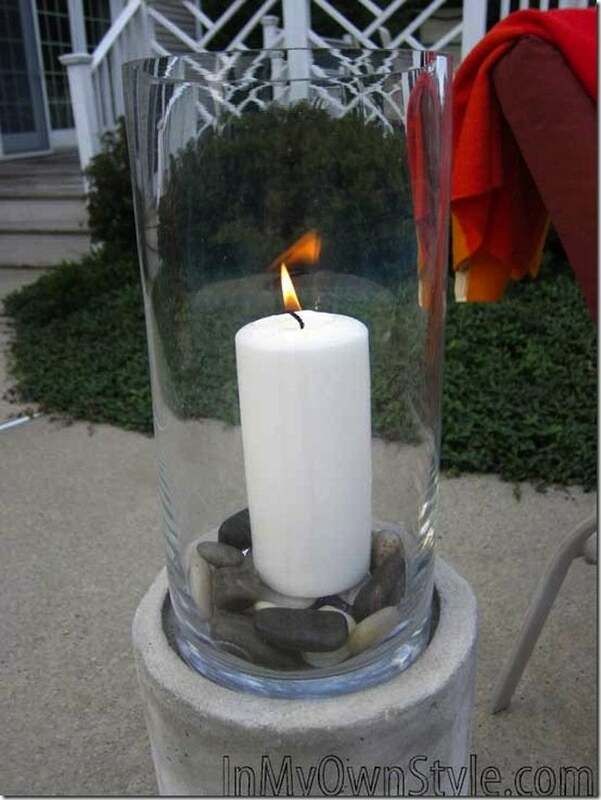 Make sure you are getting one that is at least 1-inch wider than the glass hurricane you plan to use to put on it. Figure out how tall you want each column. I gauged mine on the height of my chaise and then cut the other two in half size of each other. The smallest one can go on a table by itself when you want candlelight for dining. 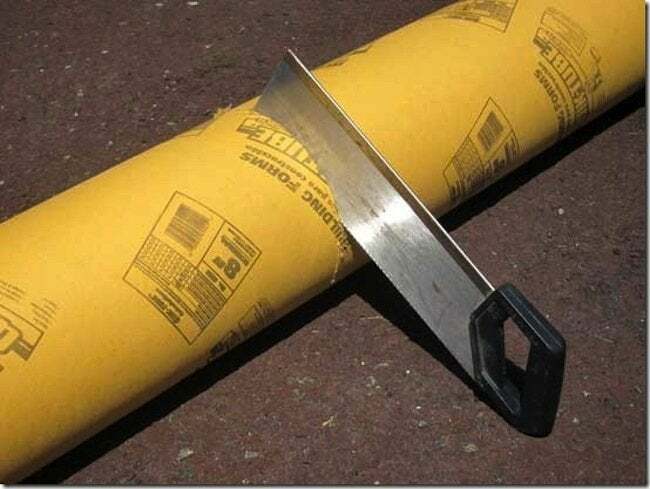 The directions from Quikrete said to use a release agent when you want to remove the cardboard tube. The guy at Home Depot told me they didn’t sell it, but told me to spray some gloss paint inside the tube and let it dry. The gloss surface would make it easier to remove the tube when the concrete was dry. Make sure the top and bottom of your cut tubes are level. Then I made a bottom for each tube using a foam plate. I used duct tape to secure each plate to the bottom of each cut tube. Then I placed the tubes on a big piece of plywood I had. Make sure the surface you place the tubes on is level. You don’t want Leaning Towers of Pisa. The plywood or plastic drop cloth is to protect the surface you are working on from the concrete. This step is the hardest only because the 80 pound bag of concrete is hard to move. 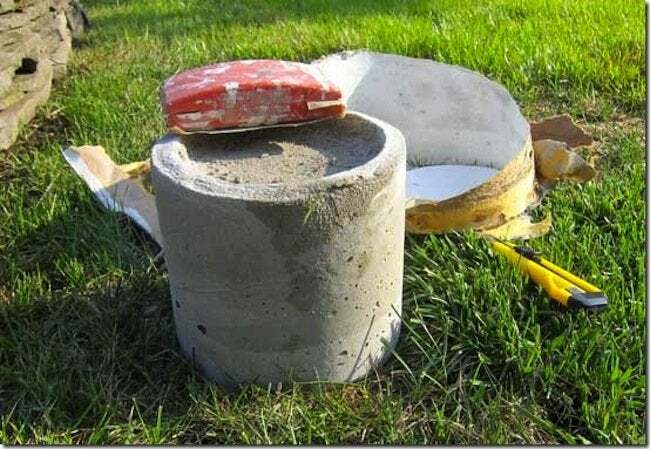 Get your bag of concrete right next to your mixing bucket. 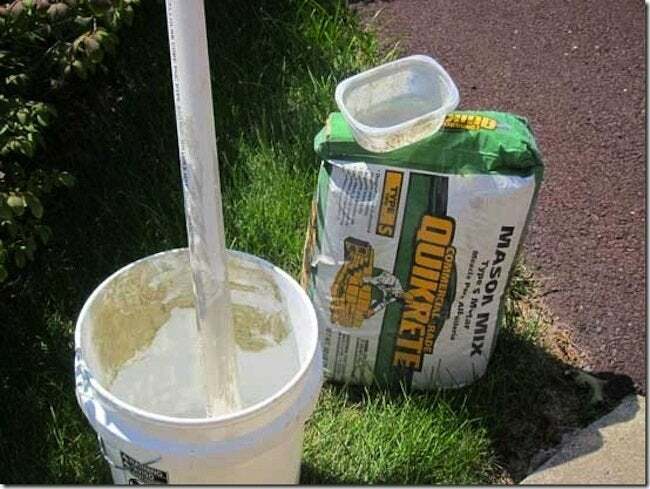 Fill the bucket with 2- 1/2 quarts of water. 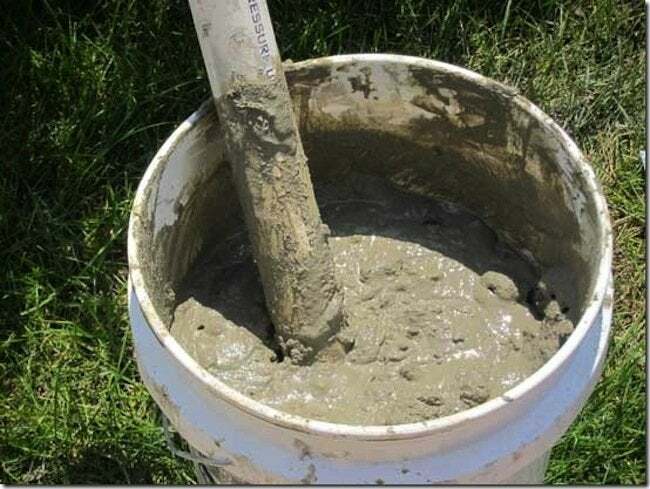 Put on a pair of rubber gloves to protect your hands—then use a scoop (I used a plastic container) to slowly add half the bag of concrete to the water in the bucket. Mix it gradually and make sure you stir it well before adding more mix. Do not add the whole bag you will never be able to stir it! Add slowly a little bit of mix and stir. The directions on the bag say to wear safety glasses and one of those little white masks as you add the mix to the water. The mix is very fine and you don’t want to get it in your eyes or lungs. 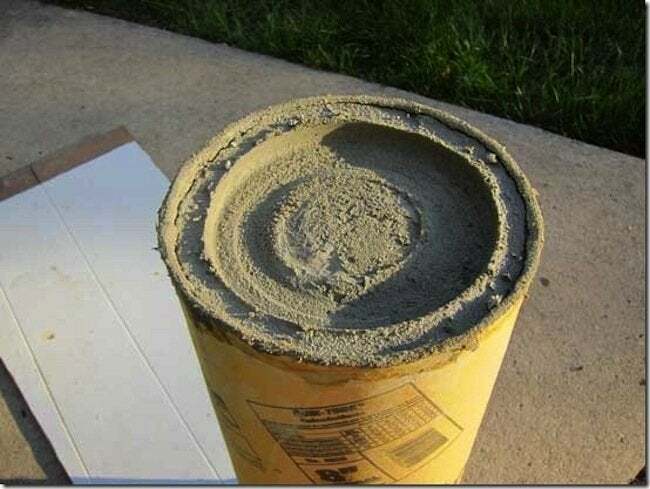 Once you like the consistency, use your scoop to add the concrete to the tube. 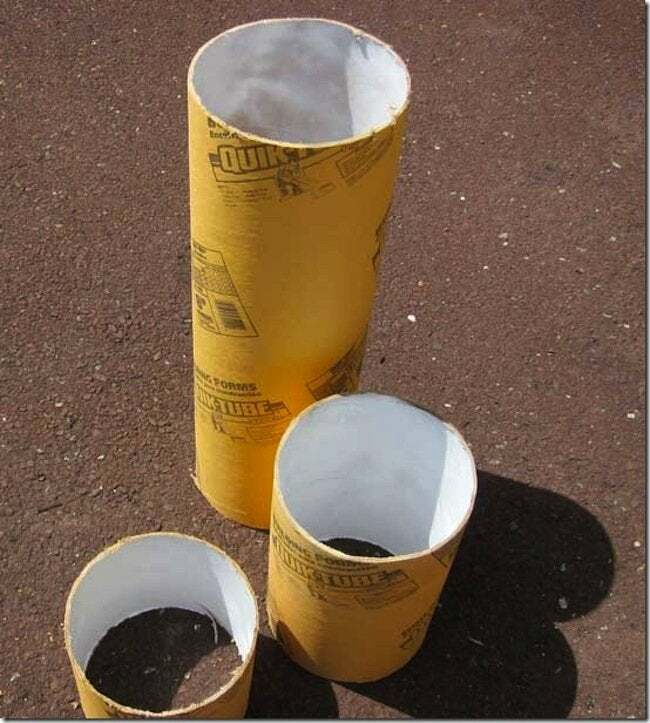 Push the PVC pipe into the tube once it is 1/3 of the way filled to make sure you are packing the concrete in and getting rid of any air pockets. Keep filling and pushing the PVC pipe until the tube is filled. 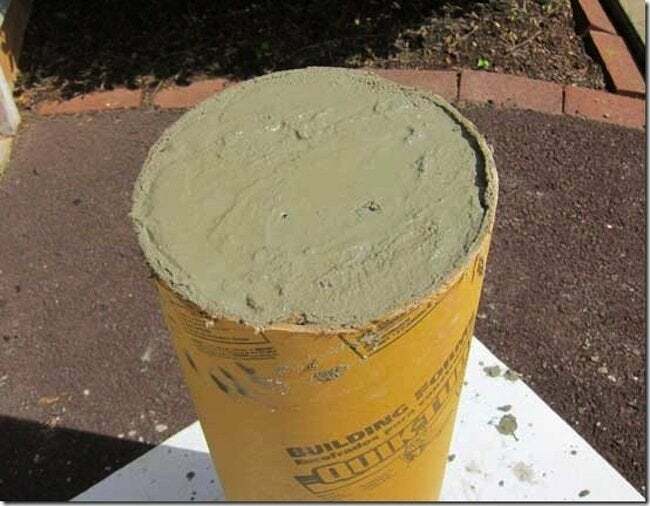 If you run out of concrete mix. Start another batch and then continue to fill the tubes. To make the indent for the glass hurricane to fit in, press a coffee can into the top. This coffee can just happened to be the perfect size. You may have to find something that is a bit wider than the hurricane you are going to use. Center it and gently push down. This will make some of the concrete come out. You want the coffee can down at least 1/2”– 1”. Smooth around the can with your gloved finger until it is smooth getting rid of the excess that has spilled out. 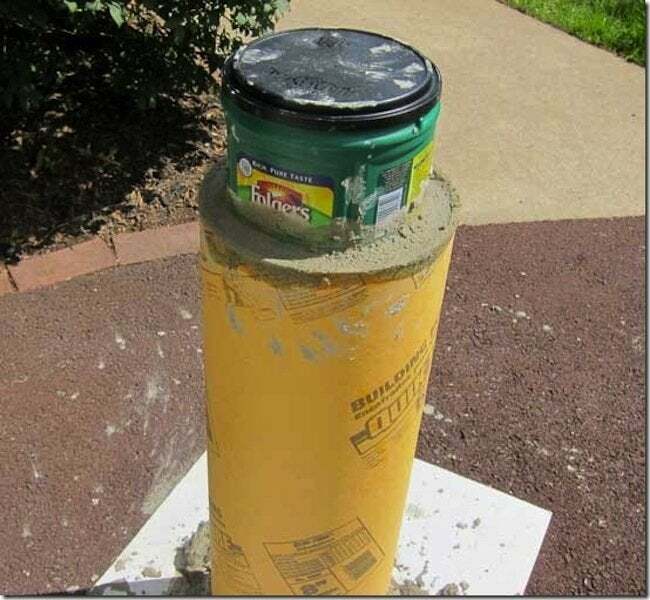 Gently rotate the can a few times to make sure the concrete on the sides of it are not going to dry to the column. As the column dries repeat rotating the can during the first few hours of drying time to ensure it doesn’t become a permanent part of the column. 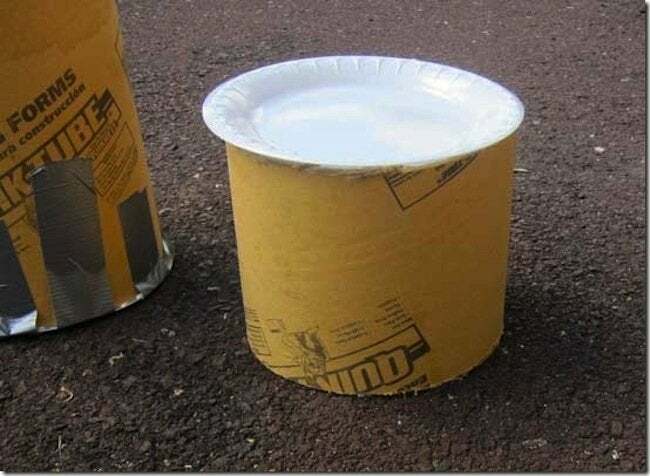 After a few hours you can remove the can. It will look like this. 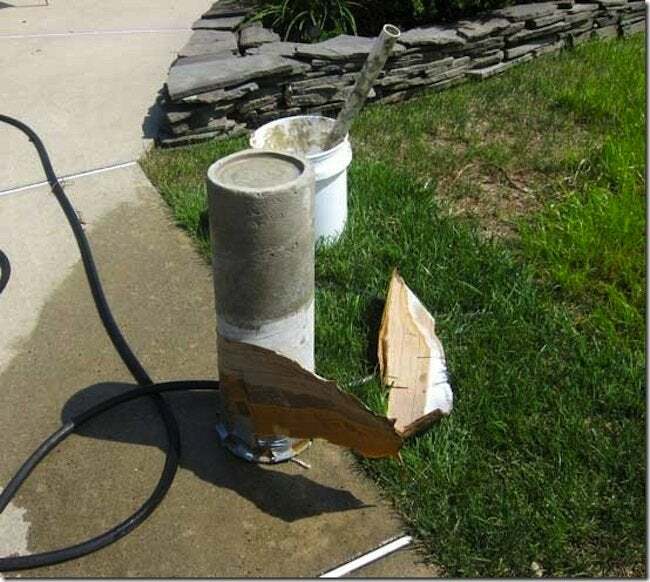 Let the column dry at least for 24 hours or longer depending on how humid the air is. 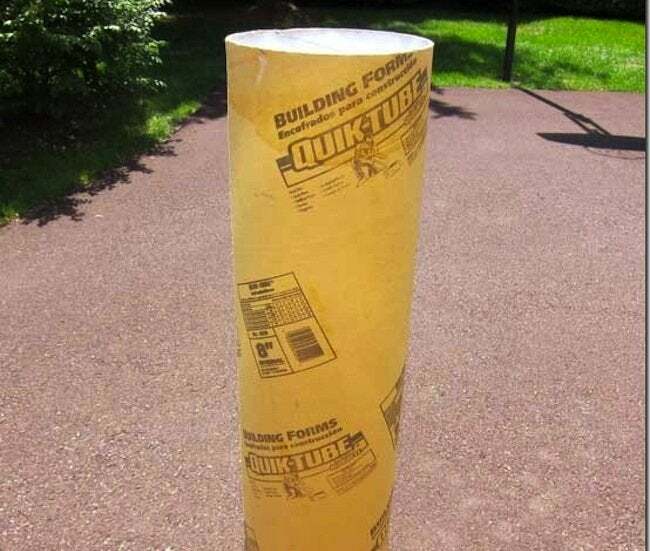 Once the column is dry, use a box knife to cut away the cardboard tube from the column. Spray it with a hose if needed to help you remove the tube. Mine came off easily. Tip the column to the side to remove the plate from the bottom. The excess concrete along the bottom edge will come off easily with sandpaper. 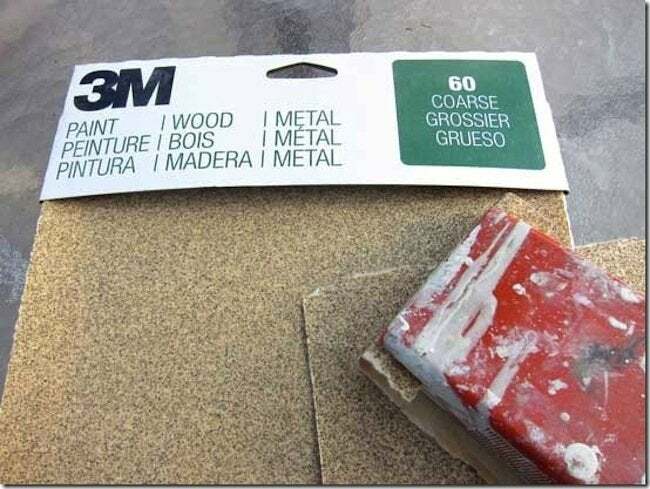 Put coarse sandpaper on a sanding block and go over the top surface to smooth. 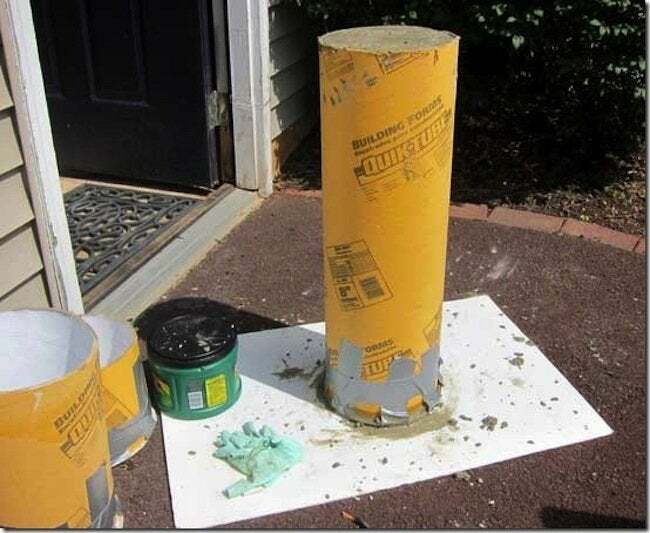 You can also use the sandpaper to get rid of any ridges along the bottom and sides of the column as well as any paint or cardboard that might have stuck. It comes right off with the sandpaper. 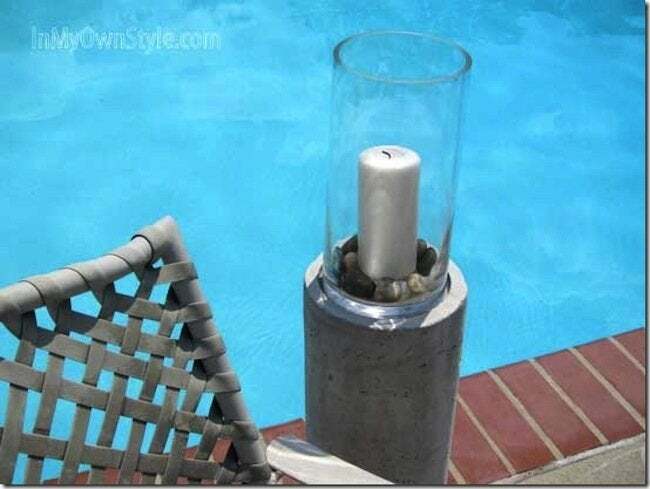 Place your glass hurricane on top. Thanks, Diane of In My Own Style! You can find even more home decor ideas on her site.